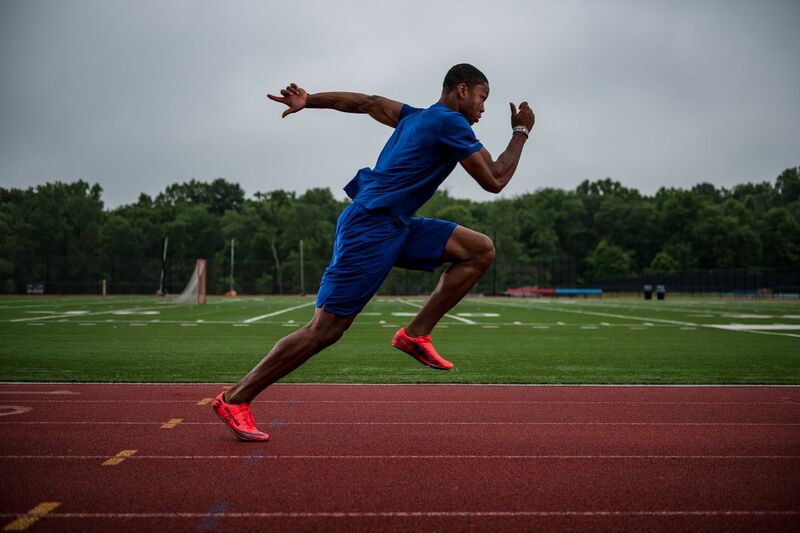 Decathlete Kyle Garland sprints during a recent workout at Germantown Academy. Kyle Garland has always had many talents. The recent Germantown Academy graduate played basketball, soccer, the violin, and drums when he was younger. It wasn't until his high school years that the 6-foot-5, 222-pounder homed in on one athletic event — the decathlon — and even that consists of 10 individual events. It was a natural fit, and Garland, who is best at the high jump and hurdles, has either won or placed second in the decathlon and the five-event pentathlon at several national and international championships. On Friday, Garland traveled to Tampere, Finland, to represent the United States in the decathlon on Tuesday and Wednesday at the International Association of Athletics Federations' under-20 world championships. "Kyle has many gifts," said Pete Jennings, the track and field coach at Germantown Academy. Garland competes in the high jump at the 2017 Penn Relays. Garland also has a long history of success in track and field. The University of Georgia recruit is a two-time New Balance Nationals indoor pentathlon champion, and he cleared a meet record 6 feet, 10 inches in the high jump at the 2017 Pennsylvania Track and Field Coaches Association indoor state championships. He also won a silver medal for second place in the decathlon at both the USA Track and Field junior national outdoor championships and the Pan American junior championships in 2017. "To be named one of the best multi-eventers in the country was huge for me, which drove me to keep progressing in it," Garland said. As a freshman at Germantown Academy, Garland showed his toughness and dedication by overcoming an ankle injury to compete later that year for his club team. "It was just astounding to everybody that he was so committed to doing the work he needed to recover [from that sprained ankle] and to compete really well," Jennings said. "Most people thought that was it for [his] freshman year, and I just don't think Kyle ever thought that." Garland qualified for the Finland trip by winning the decathlon in June at the USATF junior outdoor championships. Coached primarily by his father, Keith, a former sprinter at Temple University, Garland showed his father he was someone special when, at 14, he grew nine inches in 18 months. Keith Garland (left) with his son, Kyle, at Germantown Academy. After that, Garland began to dominate in many events at high school, regional, and national track meets. He did so well in several events at one meet that an official suggested he try the decathlon and pentathlon. "The official at the event was like. 'You do so many individual events, why not try the multi-events?' " Garland said. The decathlon consists of the 100-meter dash, long jump, shot put, high jump, 400 run, 110 hurdles, discus throw, pole vault, javelin throw, and 1,500 run. The pentathlon can be one of several combinations but is generally the 110 hurdles, long jump, shot put, high jump, and 1,500 for boys and men. Keith Garland began coaching Kyle full time when Kyle was eight and has been with him ever since. At first, Keith worried that their coaching relationship might affect their father-son bond. So far, it hasn't, he said. "We kind of had that 'Come to Jesus' moment when he was 13," Keith Garland said. "Do you want me to coach you? Are you sure?" Since he had limited experience coaching some of Kyle's events — like the pole vault and hurdles — Keith Garland studied film and YouTube videos for pointers. The pair have also reached out to other coaches for input. Jennings, the track coach at Germantown Academy, said that Garland is tireless when it comes to training. "I tried this year to make our school understand just how hard he works," Jennings said. "There is no way he could achieve on the level he's achieving if he was just comfortable competing on talent alone." In addition to his talent, Garland said he embraces routine. He prepares for competitions the night before with an ice bath, yoga session, and massage by his father. On meet day, Garland starts with an energy bar and a fruit smoothie before he stretches. "I have to do things in a perfect order," he said. Garland admires fellow decathlete Ashton Eaton, a two-time Olympic champion. As Garland looks to his future, he has his sights on being one of the three decathletes for the 2020 Olympics in Tokyo. Even though two-time Olympic champion decathlete Ashton Eaton has retired, he remains Garland's favorite athlete. "It's the way he conducts himself not just on the track but off the track," Garland said. "He is an all-around great person. He conducts his life in a way I want to conduct my life in the near future."